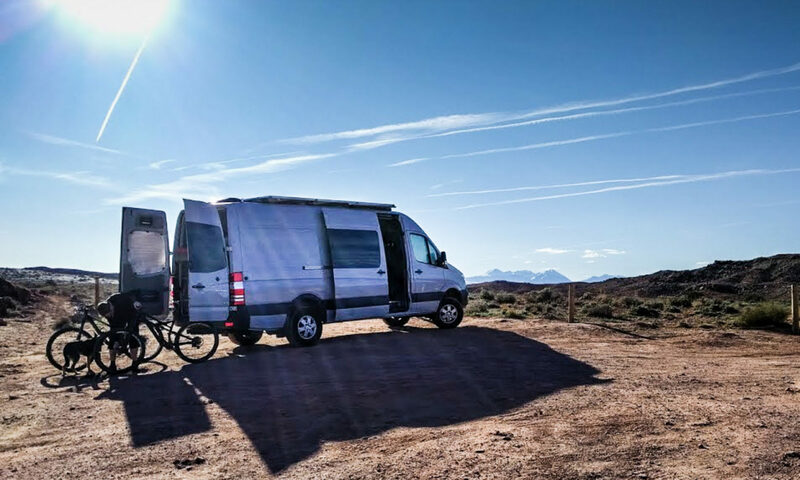 We finally got an opportunity to use the van for a biking trip. Maybe we were being overambitious to think we’d have it finished by now. Despite living out of plastic tubs, the trip was loads of fun. The inside of the van still looks like a spaceship. All reflective aluminum foil with the odd loose wire dangling down. But we do have an insulated floor, an electrical system, a diesel heater, a bench seat in its final (third row) position, and a roof fan. We loaded the mountain bikes in to the back, a cooler in the front (easier to strap down than the TruckFridge that we will finally be using), the dog crate next to the cooler, and a couple of bags of clothes under the bench seat. Then we set off for Bend, Oregon. It’s a lovely biking destination and we hit town near the end of the season but with great weather and wonderful trail conditions. Four days of riding wasn’t quite enough, but it was sufficient opportunity to test the van out and also to stock up on some local beer. On the way down we stopped at Stonehenge. It’s a monument we’ve meant to take a look at several times in the past. Somehow, with the van, taking a detour just felt more appropriate. No need to worry about leaving the bikes on the roof rack because they were locked safely inside. No need to worry about the dog because the roof fan would kick in if the inside temperature got too high. A great opportunity to take in some local sights.